Spicy hot buffalo chicken served up pizza-style. Serve with celery and bleu cheese (or ranch) dressing! Heat oven to 400 degrees F. Spray a baking sheet with nonstick cooking spray. Form pizza dough into a 15-inch by 10-inch rectangle on the baking sheet and bake for 8-10 minutes. While the pizza crust bakes, add buffalo wing sauce and shredded chicken to a saucepan over medium heat. Cook, stirring occasionally, 3 to 5 minutes or until thoroughly heated. 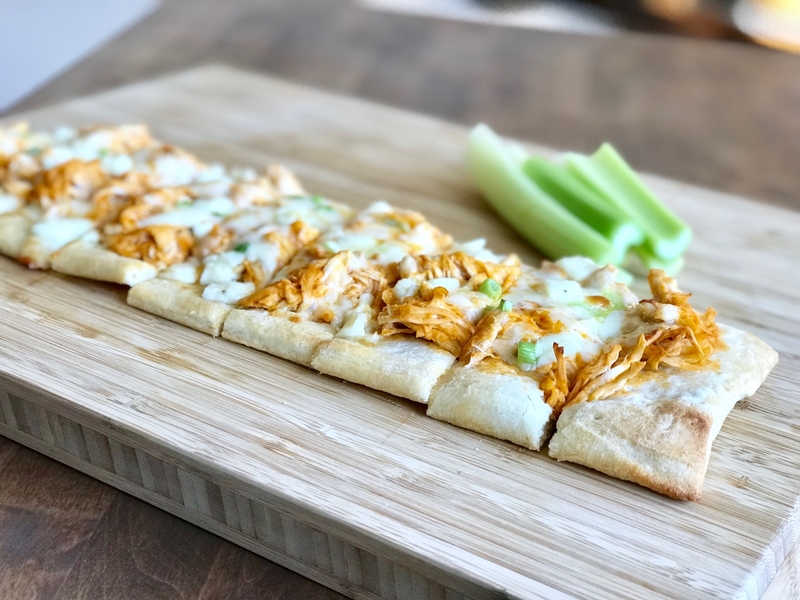 Spread the buffalo chicken over the partially-baked pizza crust then sprinkle with Muenster Cheese, ranch cheese curds, and sliced green onions. Bake for an additional 10-12 mins until cheese is bubbly. Cut into 16 sticks and serve.